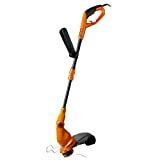 What is the Best Corded Electric String Trimmer of 2019? The Greenworks 18-Inch 10 Amp Corded String Trimmer is the best corded electric string trimmer for the value it provides. It’s time to take down those nasty weeds and grass from your yard. You have your trusty garden shears and it’s a small yard. But it’s still a decent amount of work. That’s why it’s good to invest in a good tool such as a corded electric string trimmer that’s inexpensive and gets the job done. But with so many options in the market, which one should you pick? Let us help you choose the best corded electric string trimmer that matches exactly what you need. What is a corded electric string trimmer? What are the different types of string trimmers? Do you need a corded electric string trimmer? How to choose a good corded electric string trimmer? If you’re looking for something that can cut the grass, unwanted plants, and weeds in your garden, a string trimmer can help. A corded electric string trimmer is one that runs on electricity. And you need to connect the power cord into a socket for it to work. The main component of the string trimmer that does the cutting is a monofilament line instead of a blade. This line rotates at a high speed good enough to cut through the plants. The main types of string trimmers run on gas or electricity. The electric ones could be battery-powered or plugged into a socket. If you’re looking for a high-powered string trimmer, a gas powered one is right for you. It helps to trim lots of weeds and grass in a large yard. The gas-powered string trimmer is quite mobile because it runs for quite a while with a refill of the tank. The problem with these string trimmers is the noise they produce. They need a lot of maintenance because of the engine. And they’re expensive as well. If you’re satisfied with a lesser powered string trimmer, an electric one should be sufficient for you. They are less noisy, easy to maintain, and a lot less expensive. You can get a corded electric string trimmer that needs to be plugged into a socket to work. They’re limited in mobility due to the cord but durable and inexpensive. If you’re looking for more mobility, a battery-powered string trimmer can be useful. Though they tend to be a bit more expensive. If you have a small garden, you can make do with a garden shear for trimming the grass and weeds in your garden. But if you have a large garden or some nasty back issues, it’s good to invest in a string trimmer. The string trimmer can help you trim in places where your lawn mower cannot reach. It’ll help you trim around the edges of the garden bed without damaging your fences, trees, and plants. You should choose a corded electric string trimmer if you know the tool can reach your entire garden. Otherwise, it’s better to invest in a cordless string trimmer that has even longer reach. There are certain features to look out for when you’re choosing a corded electric string trimmer to get the best value. The shaft is the portion of the string trimmer that connects the cutting head to the handle. You need to choose between a straight or a curved shaft depending on your height. If you’re tall, a straight shaft will be good for you to trim without bending. And if your short, a curved shaft will be more beneficial. The power of a corded electric string trimmer is determined by the Amperes of the motor. The higher the Amps the more power you’ll get. But that will also raise the price a bit. Such a string trimmer is limited in mobility by the cord, so it’s good to invest in a long enough outdoor extension cord for your garden. The cutting head is the part of the string trimmer that will do all the work. Make sure there’s not a big gap between the cutting head and the shaft. This will prevent tall grass and weeds from getting stuck in the gap. Ensure that it’s easy to clean the cutting head in case there are some debris stuck in it. The RPM (Revolutions Per Minute) tells you how fast the string trimmer head can rotate. The faster it rotates the better it will cut. The string or monofilament line is the part of the head that does the cutting. As the head rotates at a high speed, the string cuts through the plant. That’s why you need to ensure the string is of good quality and does not wear out fast. There are two types of string attachments available, fixed-line or spool. A fixed-line helps reduce jams in the string trimmer but wears out faster. A spool will last longer but can get jammed. String trimmers come with bump feed where you can bump the trimmer head on a hard, flat surface to extend the string. Or they may come with an automatic feed that extends the string as required at the push of a button. You’re going to be using the corded electric string trimmer a lot in your garden. That’s why make sure that the handle suits your purpose. It’s good to have a handle with a soft grip and an ergonomic design that’s easy on your wrists. Some string trimmers come with a handle that can be pivoted for the type of trimming required. And they could be extended for a longer reach. If you’re going to use the string trimmer a lot then it’s weight is something to consider. Fortunately, most corded electric string trimmers can be lightweight because they don’t have to carry a battery or fuel tank. It’s good to choose a string trimmer that has the motor on one end and the cutting head on the other so it has a good balance. The handle of electric string trimmers might be fixed. Or you might get some that can be pivoted as well as extended. So choose one based on your needs. Some string trimmers come with controls that help regulate the speed of the cutting head. You should pick a corded electric string trimmer that has good durability so it lasts you a long time. Don’t worry about spending a bit more on a high-quality tool because it’ll pay for itself over the long term. Corded electric string trimmers tend to be inexpensive compared to their gas and battery-powered counterparts. But they can vary in price based on the quality of the tool as well as the cutting power that the motor can generate. Choosing a high-quality electric string trimmer will give you peace of mind that the product will not die on you. However, it’s good if the product comes with a long enough warranty in case something does go wrong and you need a replacement. The corded electric string trimmer needs to be plugged into a socket to work. You don’t want to be working in bad weather like rain with such a tool. Make sure the cord is clear out of the way of the string trimmer while using it. You don’t want to accidentally cut the cord. Before you use the string trimmer, carefully inspect it for any kind of damage. You want the tool in perfect condition. No shaky handle, no loose wiring or parts. The trimming head is going to do the work but make sure it’s clean before you use it. You don’t want debris of weeds and grass stuck in it. That lowers the cutting power as well as wears the string and cutting head down. It’s not a great feeling to get injured by the string trimmer. That’s why you should wear protective equipment before using the trimmer. Wear a good pair of jeans and shoes that cover your feet. You want to wear safety goggles to protect your eyes from flying debris. When using the string trimmer, keep it parallel to the ground to get the best cutting experience. You want to trim the grass at the same height that your lawn mower does so it keeps the cutting even on the entire lawn. Make sure to trim in a direction that the grass clippings fall on to the lawn. This’ll help keep the clippings in one place instead of falling on to the pathways. And it’ll be easier to clean them up after the trimming and mowing of the lawn is done. When you want to edge the garden beds or pathways, pivot the trimming head at an angle so it’s possible to do so. As you trim the grass and weeds with the string trimmer, the line will get worn out and you’ll need to bring more out from the spool. If you have a corded electric string trimmer with an automatic line feed, push the button and it’ll extend the line. If it’s a type with a bump feed, you’ll need to bump the cutting head on the pathway to get more line feed out. Once you’re done with the trimming, you can use the string trimmer to blow the cut grass from the pathways. Use the trimmer in a sweeping motion over the pathways and it acts as a blower. It’s important to keep your string trimmer in good shape so it lasts for a long time. If you have a corded electric string trimmer, you’ll need to check that the cord is in good shape. You don’t want there to be any cuts that can cause accidents. Make sure to get the cord replaced in case of such problems. The same could be said about the outdoor extension cord you use. Before and after using the string trimmer, make sure it’s clean. You don’t want things like moisture, oil, and debris all over your trimmer. Take a look at whether there’s any damage on your string trimmer. It’s dangerous to use the trimmer in a damaged condition. You’ll need to get it repaired or replaced with a new one. The trimming line is the first thing that may get worn out due to its frequent use. Check it before using the trimmer whether it needs a replacement. Like your other tools, you need to keep the string trimmer out of the reach of children and pets. The best thing to do is store it at a height that’s safe from their reach. 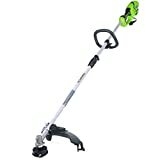 The Greenworks 10 Amp corded string trimmer should be suitable for most of your trimming needs. It comes with an electric start mechanism that makes the trimmer easy to operate. The cutting path of 18 inches along with the 10 Amp motor gives it plenty of power for trimming thick grass and weeds. The trimmer is a bit heavy weighing in at 9.9 lbs but it’s still pretty comfortable to use in the yard. The handle comes with a molded grip and cushion that makes it easy to hold and use. This trimmer accepts attachments from other brands like Ryobi, TrimmerPlus, and Yardworks. If you’re looking for an inexpensive electric string trimmer then this one is something to consider. The Greenworks 18-inch string trimmer comes with a four-year limited warranty which is pretty good. 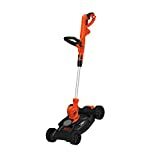 The Black & Decker GH900 string trimmer comes with a 6.5 Amp motor that should be good enough for your trimming needs. The motor comes with a high torque transmission that should give you good performance. The trimmer has a 13-inch cutting path that should help you get the trimming done as fast as possible. It comes with an automatic feed system that’ll make sure there is sufficient line feed without having to worry about stopping or bumping the cutting head on the ground. The problem some customers have reported is that the line comes out during every start which wastes a lot of it. The handle has an ergonomic design that makes it comfortable to use. The handle can be pivoted for the right cutting angle. And the height can be adjusted to give you better reach. 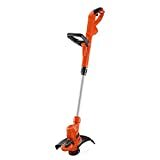 The weight of the Black & Decker GH900 string trimmer is about 7 lbs which is a comfortable weight to handle. This string trimmer comes with a two-year limited warranty against any manufacturing defects. The Worx WG119 electric string trimmer is a corded one that comes with a 5.5 Amp motor. It’s not the most powerful motor but should be good enough for regular trimming needs. One problem is that the motor is near the spool which means it attracts debris and you need to clean it well. The 15-inch cutting swatch is quite good to get some efficient trimming of grass and weeds. The shaft can be adjusted for height so you can trim at the right angles without getting fatigued. The cutting head can be pivoted into 4 positions to give you the best cutting angle possible. The Worx WG119 comes with an auto line feed system which means you don’t need to bump the cutting head on the ground to extend the line. Though it has the problem that this auto feed system sometimes does not work and you need to do it manually. This electric string trimmer weighs just 6.5 lbs which makes it pretty lightweight to carry around the yard for a long time. If you’re looking for an inexpensive corded string trimmer, then the Worx WG119 is something you should consider. The Worx WG119 comes with a limited three-year warranty which is pretty good. The Earthwise ST00113 comes in several variants of power. You can get a 2.4 Amp, 4 Amp, or 5 Amp motor based on your needs. The cutting swath can also vary and you can choose from a 9-inch, 13-inch, and 15-inch variant. The difference is in the cutting power based on how much you require. And the price of the string trimmer changes based on these as well. The cutting power is suitable for average gardening needs but not for heavy-duty trimming. This string trimmer comes with an automatic line feed for the dual-line which means you don’t need to worry about the line as you’re trimming. Some users have noticed that this auto line feed does not always work. The grip of this string trimmer is ergonomic and made of rubber and comfortable to hold for long trimming periods. It weighs about 6.8 lbs which makes it lightweight to carry around the yard for a long period of time. The handle can be pivoted so you get the best cutting angle. And it can be adjusted to the right length for you. The Earthwise ST00113 corded electric string trimmer comes with a limited two-year warranty against manufacturing defects. The Black+Decker BESTA512CM is a 3-in-1 tool that works as a string trimmer, edger, and lawn mower. So you get three tools for the price of one. Do remember that the lawn mower is OK for trimming small grass but does not work well for heavy-duty tasks. The motor is 6.5 Amps and the cutting path is 12-inch which is good for regular garden trimming needs. It comes with a PowerDrive transmission that gives a great performance to trim tough grass and weeds. It has an automatic line feed system that should help you avoid bumping the head on a surface or stopping to pull out more feed. The handle can be adjusted for the cutting angle as well as the height that you prefer. One drawback of this trimmer is there’s no speed adjustment. The entire tool weighs 13 lbs but that’s because it includes the lawn mower. If you just use the string trimmer, it’s lightweight and easy to use in the yard. The tool comes with a limited two-year warranty against manufacturing defects. We think the Greenworks 18-Inch 10 Amp Corded String Trimmer is the best corded electric string trimmer you can buy. You get a string trimmer that gives a good cutting performance without burning a hole in your pocket. It’s comfortable to use due to its weight and cushioned grip. It also accepts attachments from other brands like Ryobi and TrimmerPlus in case you need to try something else. The limited four-year warranty is an added bonus that should make you feel comfortable buying this string trimmer.